Furmint is one of those grapes that is typically hidden behind a geographical name. Its best known incarnation is in the sweet, botrytized wines of Tokaji, Hungary, where it is blended with a few other native grapes and known as Tokaji Aszú. This sweet wine has been known and widely consumed for several centuries, as there are references to Aszú wines as far back as 1576. It was frequently served at royal tables throughout Europe and the list of notable people who have written about Aszú wines reads like a who's who of world culture. The region where Aszú is made was the site of the first appellation control in the history of wine, predating the Port system by several decades. Aszú is so important, it is even mentioned in the Hungarian national anthem! Tokaji Aszú isn't particularly easy to find in the United States, but it's not terribly difficult either. Most wine stores with a fairly large inventory generally will stock at least one sweet Tokaji wine. The dry version, however, is a different story. Very little of it is exported to the US and the only place I've been able to find any is an Eastern European specialty store in Brookline, MA. The bottle I picked up was from the Royal Tokaji company, a top-flight producer of Aszú win es best known to me because of British wine writer Hugh Johnson's part ownership of the company. The vintage was 2007 and the price tag was a hefty $25. In the glass, the wine had a straw color tending to yellow gold. The color was darker than I expected in a wine this young, and I soon found out why. Strong vanilla in the nose makes me think this wine saw a lot of new oak. It reminded me very strongly of California Chardonnay, which is either very nice or very unwelcome, depending on your tolerance for that winemaking style. In this case, I really wanted to get a sense of the varietal itself, and it felt like the grape was hiding behind a massive wall of oak. Furmint is apparently not particularly aromatic, much like Chardonnay, so I may not be missing much, but it was still a bit of a disappointment. I was looking for something new and interesting and instead found something that I can buy pretty much anywhere in the US, though it was much cheaper than many high-end Chardonnay bottlings. Anyhow, the wine itself was full-bodied, rich and creamy in the mouth. There was a lot of ripe apple and pear flavors along with the creamy vanilla. I picked up a little bit of light citrus flavors reminiscent of lemon peel, but not a lot. Considering the fact that Furmint is traditionally known for it's high acidity, this wine was surprisingly flat. It is generally that strong acidic core that allows Aszú wines to age for so long, and it just wasn't really in this wine. 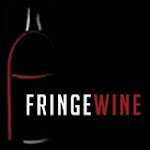 Don't get me wrong, the wine wasn't flabby; there was just enough acidity there to keep the body of the wine from going totally over the top, but it wasn't as pronounced as I had expected. Overall, the wine was fairly balanced and tasted pretty good, but there wasn't anything new or exciting about it. You can get something that tastes almost exactly like this from practically every winery in California who is producing a Chardonnay. Pinot noir is difficult to grow. Well, difficult to grow well, in any case. It is a notoriously fickle, thin-skinned grape that prefers cooler climates than varietals like Cabernet Sauvignon or Syrah. The thin skins make the clusters more susceptible to vineyard maladies and also provide less intense coloration than many of the other great red wines of the world. Marq de Villiers has written a fascinating study of the Calera winery in California titled The Heartbreak Grape, a nod to a popular description of Pinot Noir. Andre Tchelistcheff, the great Russian-born winemaking pioneer of Napa Valley's Beaulieu Vineyards, has said "God made Cabernet Sauvignon whereas the devil made Pinot Noir." There are very few places in the world where Pinot Noir can truly flourish and come completely into its own. There's Burgundy, of course, Oregon, very specific places in California, and lately some parts of New Zealand. But Rhode Island? Diamond Hill Vineyard is located just a few miles off of I-295 in Cumberland, Rhode Island. The tasting room is in a 200+ year old farm house at the end of a very long driveway that makes it easy to forget just how close you are to the scramble of interstate traffic. They've been growing vinfera vines in the state since 1976, longer than any other winery in Rhode Island, including Sakonnet, the state's flagship winery. Diamond Hill has a small acreage devoted to grapes: 5.5 acres total, with 4.5 of that devoted to Pinot Noir and 1 to Chardonnay. They produce only about 300 cases of pinot noir each year. The bulk of the wines they offer are fruit wines. 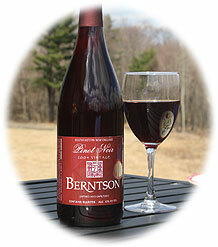 Their Pinot Noir is called Berntson and currently retails for about $25. The bottle I picked up from the winery was a 2005 (all sales are on-site). It is classic cold-weather Pinot Noir. A very pale burgundy color with some brown tint that is totally transparent . The nose is full of small red berry fruit: raspberry, wild strawberry and some delicate red cherry aromas surrounded by earthy aromas of wet leaves and damp earth. The wine is light bodied and delicate on the palate with medium acidity. The fruits are light and soft with the same raspberry and cooked strawberry. There is definitely an earthiness here that I get in a lot of Burgundies. It always reminds me of walking through the woods when I was little kid after a huge rainstorm. I label it as "wet leaves," but it's really a full wet forest vibe that I absolutely love and miss in my new urban lifestyle. There are virtually no tannins and the result is a silky texture across the tongue. If I were inclined to these kinds of descriptors, this would be the platonic ideal of a "feminine" wine. It doesn't really have very much aging potential not only because of its structure, but also because Diamond Hill uses very little sulfur in their vinification process. Is Rhode Island the next great terroir for Pinot Noir? Probably not. Newport Vineyards also makes a Pinot in much the same style while Westport Rivers, just over the state line in Massachusetts, primarily uses their Pinot Noir grapes in the production of sparkling wines and rosés. The very light colors and flavors of this wine suggest to me that it is a real struggle for the grape to fully ripen this far north. But the Berntson Pinot from Diamond Hill is a very interesting wine from an interesting location. This is my first tasting of their Pinot, and I will definitely be back to sample other vintages. Today's post is a kind of double whammy of weirdness. Honestly, I have no idea what I drank this weekend. I only know what was on the bottle, and frankly, I'm not sure if I trust it. I went to a local wine shop last week and was scrounging around in their Greek section when I came across a bottle labeled as xinomavro. I've been on the lookout for a good xinomavro based wine for awhile because I've read some really good things about the grape and am curious to check it out myself. One problem: everything I've read has said that xinomavro is a red wine grape and the bottle I picked up was a white wine. I even asked the proprietor about the disconnect between what I'd read and what I was seeing and was met with a shrug and nothing more. 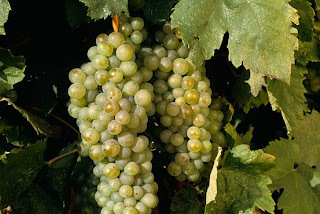 Now, I do know that white wine can be made from red grapes; if the grapes are pressed lightly and allowed almost no contact with the skins, then the resulting juice will be clear and will make white wine. I've had a white pinot noir from Germany that was vinified this way which was interesting, but made me wonder why someone would do that to a perfectly good pinot noir grape. In any case, I probably should have put the bottle on the shelf and slowly backed away, but curiosity got the better of me, and here I am, confused and disappointed. I don't think I'll go into a lot of depth here with any history or interesting facts about xinomavro because, frankly, I have my doubts that what I tasted was actually xinomavro, so I'll save that info for when I get a legitimate bottle. I have tried and tried in vain to find some information somewhere online about a xinomavro white but keep coming up empty. I can't find any reference even to the producer of this bottle online. The only information I have is what's printed on the back label, which is no help at all. It does claim that what is in the bottle is "nothing short of spectacular," which is pretty self-congratulatory, even for a bottle blurb. So what did I get? As far as I can tell, I got mineral water with a little alcohol added. The wine's color was very pale straw. A whiff of the glass yielded nothing. A vigorous swirl and another sniff: still nothing. My hand on top of the glass, shaking the glass like I was trying to mix up a paint can: still nothing. A very clean, very dumb, very boring nose. If I tried really hard, I could maybe, almost get a whiff of something like melon, but honestly, it could have just been my brain trying desperately to locate anything at all in my glass. On the palate, still nothing. This was a light to medium bodied wine with very little acidity and almost no flavor. I thought maybe I had over-chilled the wine at first so I let it sit on the counter and come down to room temperature. Now I had room temperature alcoholic mineral water. If I had to make a comparison to another type of wine, well, it's tough to draw a comparison because of how plain this bottling really is. Stainless steel chardonnay minus all the green apple flavors? Muscadet with none of the crisp acidity or minerality? Cold water really comes closest to describing this, I guess. The lesson here is that research is pretty key when shopping for wine. Hell, I even knew that the word "xinomavro" meant "acid-black" in Greek from some of my reading, and I let the shrug of the salesman convince me that maybe I was thinking of something else and was in fact mistaken. What I ended up with was a disappointment, but luckily it wasn't too costly. The bottle I picked up was a 2006 Eleftherios Estates Xinomavro White for about $14. I can't recommend this wine to anybody except maybe wine drinkers who don't enjoy the taste of wine. Today's wine is one that I knew absolutely nothing about prior to purchasing the bottle you see on the left. I was in a local wine shop, Brookline Fine Wine & Gourmet, which has an nice selection of Greek and Eastern European wines, looking for new things to try when I stumbled across this bottle. My familiarity with Georgian wine begins and ends with the trivial bit of information that the Rkatsiteli grape is native to that country and is grown voluminously there (Rkatsiteli is grown in limited quantities in the Northeastern US and will be the subject of a future post on this blog). So I went ahead and bought the bottle. I've done some research since, and it turns out that Georgia is a pretty highly regarded wine country in Eastern Europe and their wines are considered the best of all the former Soviet Republics. They rank second in production for the region behind only Moldova (there's Moldova again!). Wine history in this region goes back to between 7000 and 5000 BC and there are nearly 500 native vinifera varietals! 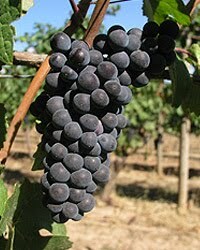 Of those, only 38 are grown commercially, and one of those grapes is saperavi. Saperavi is a very unusual grape. 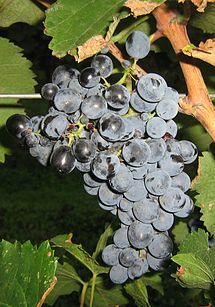 It belongs to a group known as teinturier grapes which are unique because in addition to having red skins, they also have red pulps, and therefore red juice. Most red wine grapes have dark skins and clear pulps; the color in your red wine comes from the juice's contact with the skins during the fermentation process. The pulp of teinturier grapes contains the pigment anthocyanin (the same pigment that gives beets and red berries their color and which is also a powerful antioxidant) which gives it its unusual color. Few teinturier grapes are used as the primary grape in a bottle of wine, but saperavi is one of them. Saperavi originated in the Kakheti region of Georgia, but is planted widely throughout the country. This particular bottle is from Kakheti, a rare chance to taste a wine produced in a grape's natural home. So what does Mukuzani mean? Well, Georgian wine is labeled much like French and Italian wine. What you see on the bottle is the name of the place where the wine comes from, and within those places, very particular kinds of wines are made. Mukuzani is an area in Kakheti where they are only allowed to make dry wines from 100% saperavi grapes. These wines tend to be made from grapes selected for their high quality and are watched over very carefully through the vinification process. The wine must be kept in oak for 3 years before release. What does it taste like? I'll confess, when I first opened it, I had a sinking feeling. The cork popped and a very sour smell came out of the bottle. It's a smell that I've never been able to pin down, but it seems to hang around cheap, poorly produced bottles and tends to make the wine taste sour and out of balance. A first sniff in the glass and a first taste weren't very encouraging either. The smell and flavor were akin to canned, stewed tomatoes. In color, it was dark. Really dark. Opaque, inky black in the middle to a crimson rim. At the time, I was not aware that saperavi was a teinturier grape (I'll confess, I had never heard of teinurier grapes until about an hour ago when I was doing research for this post), so the deep, intense color was bit mystifying to me, given how hollow and sour the initial nose was. At first sip, the wine was definitely full bodied with soft, well-integrated tannins, but it just tasted a little off. I poured a full glass, finished making dinner, and then sat down with the wine one more time. An amazing thing happened. The sour, tinny, stewed smell dissipated and in its wake was a dense, solid core of charcoal, pencil lead and dark dark dark cherries. Those flavors p ersisted on the palate and added some notes of black licorice and a lingering kind of scorched taste, but not in a bad way. Scorched like how sometimes a pizza from a really hot brick oven gets some black spots on the crust and those little scorched bits add complexity and character to it. That's what these flavors were like. If I had to make a comparison, I would say that it reminds me of wines from the hotter parts of the Rhone Valley like Gigondas, or even of a Paulliac from Bordeaux with the pencil lead and dark black flavors. The take home message here is that this wine is dark in every way you can think of. It is inky black in color with charcoal, smoky, ripe black fruits in the nose and palate. It is dense and layered. It is probably the Platonic Ideal of wine to serve with grilled meats, especially steak or sausage. If I have a gripe, it's that I think it could have stood to have a bit more tannic structure to hold some of that density up and the acidity could have used a little boost as well (I would rate it as low/med acidity), but on the whole, this was a huge shock and a very pleasant surprise to me. I think the producer of my bottle was JSC Corporation, but that's a guess. The picture above is the same bottle I had (mine was a 2005 vintage) and it only cost $13. This is a stellar wine at that price, and would probably improve with a few more years in the bottle.